Mayotte is located at the northern end of the Mozambique Channel in the Indian Ocean, between northern Madagascar and northern Mozambique. The territory is geographically part of the Comoros islands but has been politically separate since the 1970s. The territory is also known as Mahoré, the native name of its main island, especially by advocates of its inclusion in the Comoros. The main island, Grande-Terre (or Mahoré), geologically the oldest of the Comoros, is 24 miles (39 km) long and 13 miles (22 km) wide, slightly more than twice the size of Washington, DC. Its highest point is Mount Benara at 2,165 feet (660 m) above sea level. Because of the volcanic rock, the soil is relatively rich in some areas. A wide fringing coral reef encircling the islands ensures protection for ships and a habitat for fish. Activities for tourists include hiking and diving. Sea turtles come to roost on the southern beaches. In August to September, humpback whales can be found with their calves in the lagoon. The climate is tropical; with a hot and humid, rainy season during the northeastern monsoon season (November to May); the dry season (May to November) is cooler. The area is prone to cyclones during the rainy season. The terrain is generally undulating, with deep ravines and ancient volcanic peaks. The territory of Mayotte encompasses the largest coral lagoon in the world, more than 1,000 square kilometers in size. Like other coral reefs worldwide, the health of Mayotte's reefs has declined in the past twenty years. Natural threats include cyclones and crown-of-thorns starfish, but most of the damage is being caused by the increasing population of the islands. Increased runoff from agriculture, overfishing, direct damage due to people walking on the shallow reef flats, and water pollution are taking a toll on the coral and other sea life. In 1500 the Maore or Mawuti (corrupted to Mayotte in French) sultanate was established on the island. In 1503, Mayotte was observed by Portuguese explorers but not colonized. In 1832, it was conquered by Andriantsoly, a former king of Iboina on Madagascar; in 1833 the neighboring sultanate of Mwali conquered the area. Two years later, it was again conquered, by the Ndzuwani sultanate; a governor was installed with the unusual Islamic title of Qadi (from the Arabic word for judge), who was a sort of resident magistrate in British terms. In 1836 it regained its independence under a last local sultan. Mayotte was ceded to France along with the other Comoros in 1843. It was the only island in the archipelago that voted in referendums in 1974 and 1976 to retain its link with France and forgo independence (with 63.8 percent and 99.4 percent of the votes, respectively). 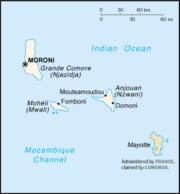 The Comoros continue to claim the island, and a draft 1976 UN Security Council resolution supported by 11 of the 15 members of the Council would have recognized Comoros sovereignty over Mayotte, but France vetoed the resolution. The UN General Assembly has adopted a series of resolutions on the issue favoring the Comoros position. The situation of Mayotte proved to be unwieldy for France: while the local population largely did not want to be independent from France and join the Comoros, some international criticism from postcolonial leftist regimes was heard about Mayotte's ongoing ties to France. Furthermore, the peculiar local administration of Mayotte, largely ruled by customary Muslim law, would be difficult to integrate into the legal structures of France, not to mention the costs of bringing the standard of living to levels close to those of metropolitan France. For these reasons, the laws passed by the French parliament must state specifically that they apply to Mayotte for them to be applicable on Mayotte. The status of Mayotte was changed in 2001 toward one very close to the status of the departments of mainland France, with the particular designation of departmental community, although the island is still claimed by the Comoros. This change was approved by 73 percent in a referendum on Mayotte. After the constitutional reform of 2003 it became an overseas community while retaining the title departmental community of Mayotte. Politics of Mayotte takes place in a framework of a parliamentary representative democratic French overseas community, whereby the president of the General Council is the head of government. Executive power is exercised by the government. Mayotte has a multi-party system, with numerous parties in which no one party often has a chance of gaining power alone, and parties must work with each other to form coalition governments. The head of state is President Nicolas Sarkozy of France, as represented by prefect Philippe Boisadam. The head of government is President of the General Council Saïd Omar Oili. The General Council has nineteen members, elected for a three-year term in single-seat constituencies. Parliamentary elections were held in Mayotte in March 2004. The Mahoran branch of the Union for a Popular Movement won the most seats, despite gaining fewer votes than the Mahoré Departementalist Movement. Defense is the responsibility of France; a small contingent of French forces is stationed on the island. Mayotte is a member of the Indian Ocean Commission, with a separate membership rather than as part of the Comoros. Mayotte is divided into 17 communes. There are also 19 cantons, each of which corresponds to one of the communes, except for the commune of Mamoudzou, which is divided into three cantons. There are no arrondissements. Economic activity is based primarily on the agricultural sector, including fishing and livestock raising. Mayotte is not self-sufficient and must import a large portion of its food requirements, mainly from France. The economy and future development of the island are heavily dependent on French financial assistance, an important supplement to GDP. 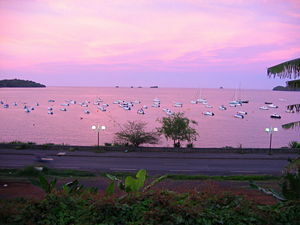 Mayotte's remote location is an obstacle to the development of tourism. Unemployment is 25 percent. Agricultural products are vanilla, ylang-ylang (a perfume essence), coffee, copra, coconuts, and cinnamon. Industries include the newly created lobster and shrimp industry, as well as construction. Export partners are France (43 percent), Comoros (36 percent), Reunion (15 percent) (2006). Imports include food, machinery and equipment, transportation equipment, metals, and chemicals, mostly from France (49 percent), Seychelles (8.8 percent), China (4.1 percent), and South Africa (2.8 percent) (2006). At the 2002 census there were 160,301 people living in Mayotte, of whom 64.7 percent were born in Mayotte, 3.9 percent were born in the rest of the French Republic (either metropolitan France or overseas France except Mayotte), 28.1 percent were immigrants from the Comoros, 2.8 percent were immigrants from Madagascar, and the remaining 0.5 percent came from other countries. The population was estimated at 208,783 in July 2007, with nearly half (45.8 percent) under the age of 14. Slightly more than half are from age 15 to 64, and only 1.8 percent are over sixty-five. Life expectancy at birth is 62.16 years (males 59.94 years and females 64.45 years). People from France, called wazungu (singular, mzungu), make up four percent of the population. They work mainly in the municipal administration and are in a position of authority. A different lifestyle, a higher economic level, and a lack of understanding of the local languages reinforce their separation from Mahorans. There is a common desire to remain French in order to preserve social equality and receive financial aid. However, Mahorans feel that they share in Comorean culture, along with certain Malagasy traits, and are united by their practice of Islam. Their French identity as an overseas collectivity is somewhat precarious, however. The status of the island within the French republic is considered provisional and will be reviewed in 2010. Mahorans, who have family ties to the inhabitants of the other Comorian islands, especially Ndzuani and the northeastern part of Madagascar, are faced with immigration from the neighboring islands, where the standard of living is lower. Ngazidja men come to marry Mahoran women to obtain French citizenship and gain the right to enter France. Poor farmers from Nzwani arrive clandestinely. Despite this migratory pressure, violent social reactions are rare. The typical two-room house is built of cob (earth mixed with rice straw), coconut fronds, or raffia. A program of social housing put in place in 1975 encourages the construction of houses made of earthen bricks and cement painted in bright colors. Two-thirds of the population lives in houses made out of solid materials, and three-fourths of houses have electricity. Televisions are more numerous than refrigerators. The food of the common people is similar throughout the Comorian Islands, with rice the staple of the daily diet, along with manioc and other root vegetables, plantains, fresh and dried fish, and milk from grated coconuts. Products imported from France and South Africa are more common in Mayotte, which has several supermarkets. Sports, music, and dance are the most common activities sponsored by associations. Local television broadcasts their special events, such as the deba or the wadaha. The deba is a Muslim prayer that is sung and danced with the head and hands by veiled young girls covered in gold and flowers. The wadaha, the dance of the pestles, is an exercise in manual dexterity and seduction, conducted to a vigorous musical rhythm. The Great Wedding ceremony arusi is a festival. These events reveal the degree to which Mahorans want to preserve their ancient social values and affirm their social position in a way that is specific to the local culture. These ceremonies provide an opportunity for entertainment (music and dance), as well as social interaction. Oral literature is being assembled and transcribed, though young fiction authors have begun to write in French. Traditional pottery has become scarce, but painting has begun to appear, practiced by wazungu artists and Mahoran youth. Theater in native languages (Comorian or Mayotte-Malagasy) is performed in villages, combining humor and social criticism in such areas as parent-child relations, marriage and polygamy. Contemporary music blends Comorian and Malagasy styles with Creole and European genres. Sunni Islam is the major religious affiliation, accompanied for part of the population by a cult of possession of Mahoran spirits known as patros and Malagasy ones known as trumba. Islam is practiced in mosques. Worship of spirits takes place in holy places (ziara): on sites where houses once stood, in the ruins of former mosques, and at the tombs of sheikhs. There, spirits of the earth or of ancestors are summoned and partially Islamized rituals are performed. Various dialects of the Comorian language essentially imported by immigrants who have arrived since 1974. French, the only official language, is the language used by the administrators and the school system. It is the language most used by television and radio stations as well as in commercial announcements and billboards. Despite this, Mayotte is one of the French overseas territories where the knowledge of French is the least developed. In the 2002 census, only 55 percent of people older than 15 years old declared they could read and write French, although this figure was higher than those who can read and write Shimaore (41 percent) or Arabic (33 percent). With the mandatory schooling of children and the economic development implemented by the French state, the French language has progressed significantly on Mayotte in recent years. A survey conducted by the Ministry of National Education showed that while first and second language speakers of French represented 56.9 percent of the population in general, this figure was only 37.7 percent for the parents but reached 97.0 percent for the pupils themselves (whose age is between ten and 14). Already there are instances of families speaking only French to their children in the hope of helping their social advancement. With French schooling and French-language television, many young people turn to French or use many French words when speaking Shimaore and Kibushi, leading some to fear that these native languages could either disappear or become some sort of French-based creole. ↑ Ben Cahoon. Information on Mayotte. Worldstatesmen.org. Retrieved January 13, 2012. ↑ Department of Economic and Social Affairs Population Division (2009). World Population Prospects, Table A.1. Retrieved January 13, 2012. ↑ Christophe Trouillard, Camélia Louachéni, et Matthieu Morando, 2007 Mayotte population census: a fourfold increase in population in 30 years National Institute of Statistics and Economic Studies (INSEE). Retrieved January 13, 2012. ↑ 4.0 4.1 (French) INSEE. 8.1 Produit intérieur brut (PDF). Retrieved August 21, 2010. Central Intelligence Agency, Mayotte World Factbook (September 20, 2007). Retrieved March 7, 2008. Countries and Their Cultures. Culture of Mayotte Retrieved March 7, 2008. This page was last modified on 11 September 2018, at 16:25.